You will not want to miss this very special event newly developed just for Taste of the Beach 2017. This multi-course wine-paired dinner features a collaborative effort between 3 OBX Chefs and 3 of North Carolina’s best Chefs. Please join us at our host, Basnight’s Lone Cedar Café for what will be an unforgettable meal and evening. 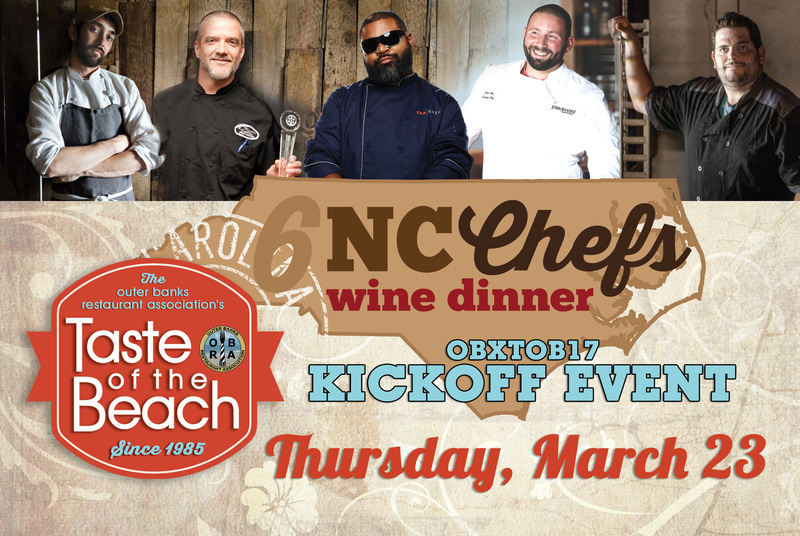 Three OBX chefs are joined by three top chefs from throughout NC to bring you a six (6) course dinner highlighting the cuisine of these award-winning chefs and their local ingredients, with each course perfectly paired with one of North Carolina’s finest wines. From the coast’s oysters, shrimp and fresh catch to foraged mushrooms and pastured heritage pork from western NC, and the fine produce from the farms in between, this will be a celebration of the foods and the people that bring it to table. This event will feature local and visiting chefs, some of which you may have seen on the Food Network, Top Chef, and UNC television!